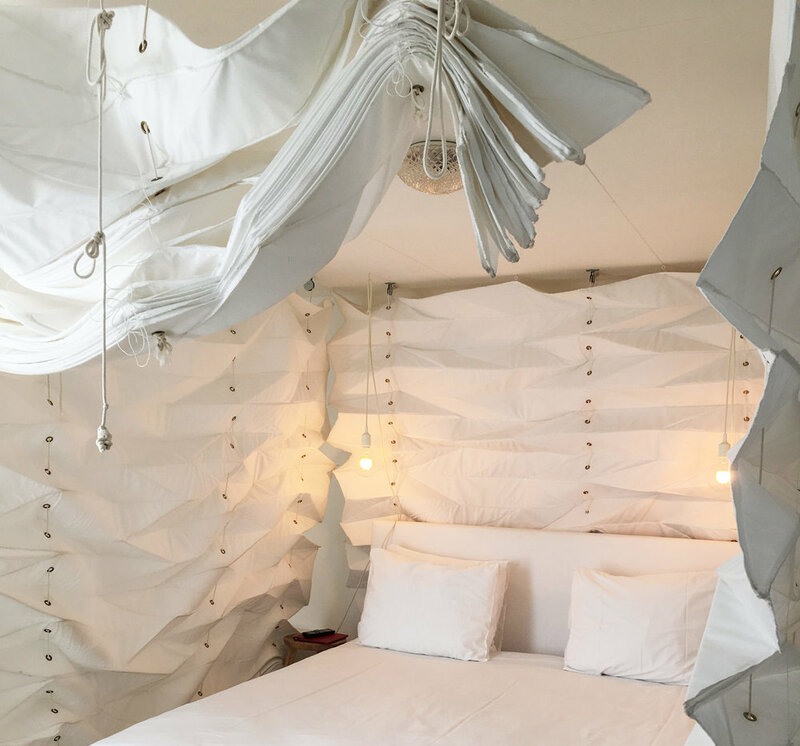 Beautiful, yet unusual rooms at Hotel The Exchange. As you’ll have known, I’ve spent a week in Amsterdam at Hotel The Exchange. Leon (of @hungrysydneysiders) and I managed to find out typical Dutch treats and snacks to share with, in this blog. Here, I’ve teamed up again with Hotel The Exchange to create this season’s food guide. I’ll be talking about the amazing Dutch eats that are minutes away from Hotel The Exchange. There is such a wide variety to choose from. For something delicious and Dutch, we ordered Café STOCK’s pancakes with ham and cheese. The combination, is just perfect. I had to try the sweet version with a squeeze of fresh lemon and syrup. It tasted just as yum as the savoury ones! Dutch pancakes for breakfast at Cafeé STOCK, Hotel The Exchange. For those who are planning to visit Amsterdam, it's good to know that Hotel The Exchange is currently offering guests who book their breakfast in advance, their STOCK menu for €13.50 (the usual price is €15.00. ). This includes coffee or tea, freshly squeezed orange juice, a boiled egg, a croissant and a sandwich. Left or right? When in Amsterdam, you have got to try the raw Herring. Now, care to join me on a typical Dutch foodie adventure? First stop, we’re going to try some Dutch raw fish (and it has nothing to do with sushi!). Stubbe Haring is only 7 minutes walk away from Hotel The Exchange. It’s hard to miss the fish stall as you will see many locals surrounding the food vendor, on the Singel Canal. This is a typical Dutch street food. I found out it’s an old Dutch tradition dating back 600 years! My favourite has got to be the raw herring served in a bun, complete with onions and pickles. It’s called a broodje haring. Leon of @hungrysydneysiders took the challenge of eating like a Dutchman. For the brave and adventurous, I would highly recommend eating like a Dutchman where you’ll eat the raw herring ‘straight up’ by holding it by its tail and slowly eat it. Stubbe Haring's raw fish was strangely delicious! Soft in texture and it smells fresh and salty. This place is a local (and also a tourist) hotspot, so make sure you don’t arrive too late in the evening, as the fish stalls selling raw Herrings normally close early. For those who have never heard of Stroopwafels before, it is to-die-for! It is basically a yummy Dutch waffle made from two thin layers of baked dough. The middle is spread with creamy and buttery caramel syrup. Stroopwafel, when translated into English simply means “Molasses Waffles”. These Dutch cookies are best when fresh and I’m taking you to the yummiest in town - Van Wonderen Stroopwafels. It is a mouthful to pronounce, isn’t it? Van Wonderen Stroopwafels is just 11 minutes away from Hotel The Exchange. This Dutch dessert place is heaven! The large cookies are made fresh to order with all sorts of colourful toppings - mini marshmallows and M&Ms are my favourites. What I loved about these fresh Stroopwafels is that, it is not too sweet. I can have two of them, anytime! 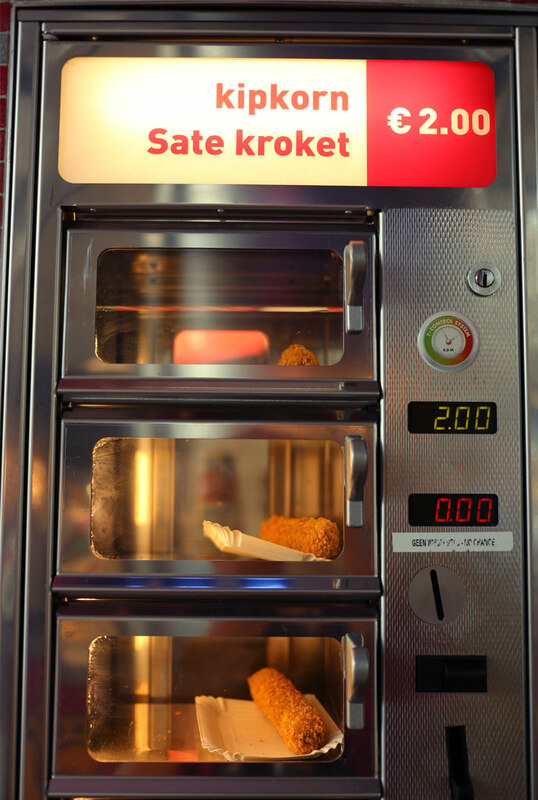 If you need a quick snack then your in luck, Just one street away from Hotel The Exchange, is FEBO. What’s a FEBO, you might ask? It truly food on the run, the best way to grab a bight when your in a rush. Basically its a hot food vending machine that is refilled every couple of minutes offering fresh and delicious hot treats. All you need to do is make a choice from the window slots, the range includes Dutch classics -delicious kroket, frikandellen, hamburgers and kaassoufflés. Then, all you need to do is to put the right amount into corresponding window slot and voila, the door opens with your mouth-watering snack ready to eat. My personal favourite has got to be the satay flavoured kroket. Thank you for reading this post for a foodie adventure in Amsterdam. More to come on what to eat when staying at Hotel The Exchange! Have a wonderful autumn season all! And for those living in the Southern Hemisphere, happy Spring! Back in Holland for the third time, this time, I’ll be spending a week in Amsterdam, exploring the Dutch cafes and bars that are unique to travellers and foodies. Leon (of @leonventures) and I were all checked in at Hotel The Exchange. This Dutch fashion hotel is located in the heart of Amsterdam. Just a few minutes walk from the central train station, it’s close to many awesome cafes and bar. The quirky Rembrandt room in Hotel The Exchange, Amsterdam. Photo by May Leong. Here, I’ve teamed up with Hotel The Exchange to create a yummy food guide. Read up to find out all the best places to grab a bite around this fashion hotel. This food guide collaboration will be Quick and Comfy, followed by Comfy with Typical Dutch and Foodie's Delight in the next two months. Café STOCK is just next to the Hotel The Exchange, smacked in the middle of the busy Damrak street. Pop over from Central Station. It’s a great spot for people watching. I love Café STOCK’s quirky interior of hand illustrated wallpaper and simple furnishing. Yummy apple pie and chocolate cake at Cafe STOCK. Photo by May Leong. We started off our day with a delicious spread of apple pie, chocolate cake and muffins. The chocolate cake is rich and oozing with dark chocolate. It goes perfectly well with a hot cup of tea. Hotel The Exchange is currently having a free breakfast special when guests book on their website. Use the promocode "MORNING!" to receive free Cafe STOCK breakfast on one day of your stay until 1st of November (max for 2 persons). Melly’s Cookie Bar is a great place to grab a quick espresso coffee, and a light snack (cookies, of course). It has a cute mint green colour interior with loads of natural lighting too. Melly’s has a good selection of cookies, my personal favourite is the Double Chocolate. A nice spot to have a cookie and a cup of latter with my #instagramhusband :) . Only 5 minutes walk from Hotel The Exchange. Photos by May Leong. It is just a 5 minute walk from Hotel The Exchange, through narrow and quirky lanes to Melly’s, away from the hustle and bustle of the Damrak. It’s a perfect stopover if you need a quick snack to recharge. De Laatste Kruimel (in Dutch, it means ’The Last Crumble’) is only 10 minutes walk away from Hotel The Exchange. The apple pie, goats cheese quiche and courgette cake with lemon curd are all to-die-for! It’s true to its word, we ate every last crumble of the delicious treats. My favourite has got to be the courgette cake (courgette is also known as zucchini to some). Mouth-watering from the moment I had my first bite. This place is a local (and also a tourist) favourite, so be prepared to stand in line or wait for a table. Small and narrow, I’m surprised how many people De Laatste Kruimel could squeeze in sometimes. Just two streets away from Hotel The Exchange, it takes only 4 minutes to pop over the Cut Throat Barber Brunch & Bar. This bar also doubles up as a barber shop, great for men who are looking for hipster haircut and a shave. Oh those mouth-watering Chicken 'n Red Velvet Waffles with Surf 'n Turf Burger. Photo by May Leong. We’re here at Cut Throat Barber Bar to try their famous Chicken ‘n Red Velvet Waffles. It does not disappoint. On top of that, we also ordered Surf ‘n Turfburger and Spiked Shakes. The Spiked Shakes comes in three yummy milkshake flavours, and we went for Chocolate and Strawberry milkshakes, with a dash of Vodka in it. Cheers to our first night in Amsterdam! Cheers to our first night in Amsterdam. Photo by May Leong. Thank you for reading this blog post. More to come in October and November on what to eat when staying at Hotel The Exchange! Dinner time at City Bar & Restaurant, in Grand Central Hotel, Barcelona. It was a lovely dinner date. A night to remember. Photos by May Leong and Leon Korobacz. Leon (of @hungrysydneysiders) and I were invited to dine at Grand Hotel Barcelona's City Bar & Restaurant. This stylish restaurant is set in the heart of Barcelona. After a couple of days eating tapas, we booked a table for two. It was a couple's date night indeed. City Restaurant offers one of the best fine dining in town. The cuisines here are more of traditional Mediterranean bistro-style cooking, which we love. There is also a good selection of local wines to pair with our dinner. For appetizers, we ordered Roast Meat Croquettes and Cod Fritters wiht Honey and Lime. It all sounded too delicious, as we have never tasted croquettes with roast meat, let alone tried, soft Spanish bread with tomato spread on it. It was all yum! I am a seafood lover, and when I saw the Entrées Tomato Gazpacho with Peach and Lobster, I had to try it. The gazpacho is a yummy Spanish cold soup, made with fresh, organic tomatoes, cucumbers and bell peppers. Now, Tomato Gazpacho with a Peach and Lobster as a starter that sounds truly exotic to us, Sydneysiders :). They ran out of lobster, and replaced it with caviar which is a bonus! We had the Potato, Quinoa and Kale salad. Charcoaled Grilled Turbot with Tomatoes and Capers. For desserts, we had to try Catalan Crème Brûlée and Red Berry Cheesecake. They were 'berry' nice indeed. Thank you for having us, it was an unforgettable evening dining at City Bar & Restaurant. Great service and delicious food. We are looking forward to be back again! Milkshakes and delicious dinner at SNCKBR WEST, Amsterdam with May Leong and Leon Korobacz. When you say, 'Snackbar' in Holland, it simply means having a snack at well known fast food chains. Well, SNCKBR WEST in Amsterdam begs to differ. It is simply one of the healthiest and yummiest food I ever had in Holland. I was here last year and now I'm back again hehe. Well, we did a little cheeky SNCKBR treat, even the vegan freakshakes are free of additives. Using soymilk as base, we are loving the Tha Sugadaddy and The Macho Mango. Who doesn't love whipped coconut cream, raw cacao and fruity mango in their milkshakes? For dinner, we kicked off with the Chef's Platter, which consists of the Hummus Superbowl (super yum), Aubergine Canneloni and Falafel. The pita bread that came with were so soft and fluffy, they go so well with the hummus and falafel. Loving it! We had the Meat Platter and Fish of the Day, served with salad on the side. Everything was just fresh and beautifully cooked, I was so happy I returned to SNCKBR and am looking forward to have another feast the next time I'm in Amsterdam again.